But how exactly do you fine-tune this skill? First, it's important to evaluate accurately, in hard, clear terms, just how fast you can expect to read using the subvocal linear approach. Second, you must learn to anticipate and overcome the speed plateaus you'll encounter periodically as your reading speed increases. • 200-400 words per minute. In this speed range, you are reading rather inefficiently. There are periodic or frequent regressions, where you stop and look back over material you've already supposedly read. Your mind tends to wander, and your concentration is relatively poor. • 600—900 words per minute. This is the highest possible speed for those using the subvocal linear approach. It does represent a significant level of achievement. At this level you do not regress; your concentration is high; and your underlining hand motions and horizontal, linear eye movements are operating at their top level of efficiency. About 900 words per minute is the absolute maximum speed a student can hope to reach by using the subvocal linear technique. 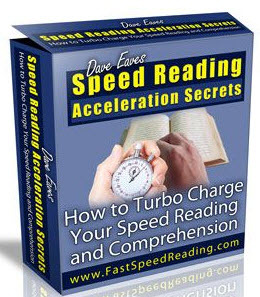 In a sense, this speed represents a kind of "sound barrier" for speed reading. To break through it, you need to employ different tools and techniques. It's at this point that visual-vertical reading and other, more sophisticated study strategies and hand motions become necessary. On the other hand, although there is an outside limit to this subvocal, "subsonic" kind of mental flight, those who have perfected this technique really do seem to untrained readers to be whizzing quickly through the printed page. The difference between this top subvocal linear plateau and the average student's reading speed is startling in many ways. Think about it for a moment: A person reading a 90,000-word book at 900 words per minute would finish in 100 minutes, or an hour and forty minutes. By contrast, a student reading at the average of 250 words per minute would take 360 minutes, or six hours. So if you never move through the 900-word-per-minute barrier, you'll still be in much better shape than if you stay at your present level. On the other hand, I can promise you that you will crash through that subvocal barrier into the realm of Mental Soaring—if you first learn the basics of subvocal linear reading, and then try the visual-vertical approach. Now, what are these basics that can turn you into a highly efficient subvocal linear reader and move you up toward the 900-word-per-minute barrier? Be sure you can see the page. This may seem an all-too-obvious point, but you'd be surprised at the number of people who have to hold reading matter at arm's length, or right under their noses, in order to read. It's absolutely essential to wear properly prescribed glasses if you need them. If you don't have the right prescription, you'll automatically be limited in how efficiently or quickly you can read. This reminds me of a student who was farsighted in one eye and nearsighted in the other. Without glasses, he could read with his nearsighted eye, but the words were unintelligible to his farsighted eye. Unfortunately, he spent months trying to struggle along, reading with his one good eye—until he finally decided to have an eye exam and buy some glasses. With corrected vision, he found that his reading speed and endurance increased dramatically. Select a quiet, comfortable environment. To reach your full potential, you'll need a quiet room or corner, with as few distractions as possible. Be sure the lighting there is bright, and conducive to easy reading. A dark area makes it necessary to struggle over words that you can't see well. On the other hand, a glaring light, with too much reflection, may make it equally difficult to make out words and can induce headaches. Finally, it's absolutely essential to have a solid, firm writing surface on which to jot down notes. As we move further into developing your study techniques, you'll discover that the drafting of a "recall pattern," or note outline, is an essential part of the learning process. But to take efficient notes, you must have a desk or table that makes writing an easy and comfortable experience. Choose a chair that's comfortable but upright. Reclining as you read makes it hard to handle the book efficiently, and creates terrible problems as you try to take notes. Also, leaning back too much or lying down just encourages most of us to nod off. As we reviewed these points in one class, a student objected, "Studying is unpleasant enough—at least let me relax while I'm reading!" But on analyzing the situation, she discovered that even though she was getting plenty of rest, including a number of naps during her study period, she was spending about twice as long as necessary covering the assigned material. Simply shifting to another, more upright chair immediately cut many minutes off her study time. Break your book in. Certain mechanical considerations are extremely important in increasing your reading speed, and one of the most important is preparing a book so that it's easy to handle. Breaking in makes page-turning much easier and also helps preserve the book in good condition. It's essential, especially when the student moves into very high-speed reading, for the book to lie flat on the desk or in the hands, and for the pages to turn easily. Otherwise, you may inadvertently cut hundreds of words per minute off your reading speed. To break in a book, place it on your desk or another flat surface so that it rests on its spine, on the binding. Then open both the front and back covers slowly, until they rest flat on the table. (Continue to hold up the pages of the book, at right angles to the table.) Allow a few pages from each side of the book to flop down toward the desk, and run your thumb or a finger down the inner margin, against the inner binding, to flatten the pages out. Continue this flattening process until the entire book is open on the table, parted approximately midway through the pages. Then flip through the the upper and lower corners of the pages of the book, as you would through a deck of cards, to make them more flexible for page-turning. Become an active page-turner. Efficient page-turning is a major mechanical tool for moving into the upper ranges of speed reading. The first thing you should do to become an efficient page-turner is assume an active attitude. The best readers are participatory readers who get deeply involved in moving through printed matter. They design their own learning framework and set up the best structures for assimilating and using new information. They establish the pace at which they want to move through printed material, and in general, orchestrate their own learning process. Essential to the establishment of a good pace for studying is learning how to turn pages effectively. To become an active page-turner, first sit up straight, with your feet flat on the floor. When you slouch, you become less alert and therefore less involved with your studies. On the other hand, sitting up straight and choosing the rate at which you'll turn the pages encourages participation and enhances concentration. What is the best technique for turning pages? A right-handed student will usually pace himself with his right hand. So most often, it's best for right-handers to turn pages with their left hand. We've found it's best for right-handers to place the book flat on the table and wrap their left forearms and hands around the top or back of the book, so that the fingers of the left hand rest easily at the top right corner of the book. The index finger of the left hand should snuggle just under the page at the upper right-hand corner. Applying slight pressure with the other left-hand fingers against the top right-hand pages should cause the pages to lift up slightly so that you can insert your index finger under the first one. With your left hand and index finger in this position, you're poised to flip the page over slightly just as you finish reading the bottom part of the right-hand page. Important: Your page-turning hand and finger should always be in position by the time you've reached the middle of the right-hand page in your reading. Then, when you finish the page and have turned it, once again position your left hand and index finger so that you're ready for the next page turn. A different approach is necessary for left-handers. The left-hander should pace himself with his left hand and let his right hand do the page-turning. But the left-hander should usually hold the book at the base of the spine with his right hand and then also use his right hand to turn the pages from the bottom of the book. Of course, none of these page-turning positions or techniques represents a hard-and-fast rule that you must follow. They are only suggestions. The important thing is for you to find the position that is most comfortable for you and that enables you to turn the page most easily and quickly, with a minimum of shifting or movement. Use the underlining hand motion. The underlining hand motion involves just what its name implies: You move your hand from left to right across the page under the line of type you're reading, as though you were drawing a line underneath the words. First, the motion helps you coordinate your eye movements with your hands at a predetermined pace as you read. This skill becomes increasingly important later as you learn other, more complex hand motions. Second, the steady underlining motion helps keep your eyes from stopping on single words or terms in the text. Third, the motion keeps you moving forward in the text and minimizes or eliminates regression. The explanation below assumes a right-handed reader, who will typically use his right hand to execute the movements. Left-handers should follow the same procedures with their left hands. • Place your right hand palm-down on the page, with the thumb against or folded under the palm. • Relax your fingers and spread your hand out fairly flat on the page. • Move the tips of your fingers along smoothly across the page, just under the line you're reading. • At the end of the line, lift your fingers about a quarter-inch to a half-inch above the page, and then bring your hand back diagonally down to the beginning of the next line. Don't skip any lines. • Repeat this procedure down the page. Don't regress as you read. Assuming an active approach toward reading and using the underlining hand motions will minimize a tendency to read back over material you've already covered. Sometimes you'll feel you've missed something, and the temptation to reread a passage will become almost overwhelming. Resist it! Believe me, there will be plenty of opportunity to go back over a passage at the end of a study or reading session if you feel you have to. Almost always, however, you'll find yourself picking up material later in the text that you think you've missed. Or you may find that the material wasn't that important after all. Most people read as slowly as they do because they allow themselves the luxury of a wandering mind or an undisciplined, regressing approach to reading. This leads to the habit of rereading and to very low reading speeds. But if students don't allow themselves this luxury, they can break the bad habit—and their reading speeds will begin to soar. Also, a pervasive fear that they're going to miss something essential grips most readers. As a result, they read, and reread, and /-¿reread in an effort to pick up everything. Unfortunately, this approach actually tends to reduce comprehension and understanding, rather than improve them. Most studies confirm that moving along swiftly and systematically, with little or no regression, enhances comprehension. Nothing that's important will be missed with this approach, and steady reading makes it easier to understand the flow and continuity of the text. But to believe this fact, it's necessary to put aside fear and venture forth into the untested waters of faster, more efficient reading. Fear is a theme that will emerge again and again in these pages. For example, when readers begin to try their wings beyond the 900-word-per-minute barrier with visual-verti-cal techniques, they typically become anxious. They say to themselves, "How can I possibly read this way? I won't retain or understand a thing!" If this sounds like you, don't worry. With practice, you'll learn there's no reason for fear, other than the fact that you're delving into the unknown. When you become more familiar and comfortable with the new techniques, the fear will disappear. The same is true of regressive reading. You may hold onto your safety net—rereading—out of concern that you'll miss something important. But if you throw that net away, you'll find your comprehension actually increases, and your speed increases dramatically, too. To illustrate what I mean, let's try another reading test. You've been using basic hand motions and some of the other tools I described in chapter one. Now—in perhaps the only major exception I'll ever make to my no-regression admonitions—I want you to go back to page 17 and reread the list of techniques for efficient subvocal linear reading. In particular, be sure that you're in a comfortable position; that you're turning pages efficiently; and that you're using that underlining hand motion, with no regression. Now for the test. Have a pad and a pencil nearby. Look at your watch with the second hand and note on the pad the exact minute and second. BEGIN READING NOW. I'll stop you at some point later in the text so that you can see how your reading speed has improved.